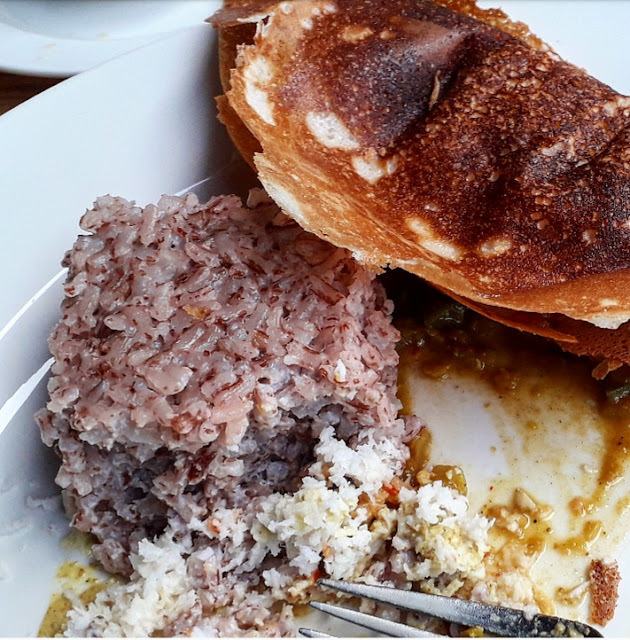 Five Foods you must try when you visit Sri Lanka. If there is one thing I did in 2018,it's that I ate to my heart's content.As with all things this has it's benefits and disadvantages.The good however outweighs the bad. For one I have no regrets or thoughts like 'maybe ningekula ile cake last week'. Sometimes I think maybe I should have gone easy on the rice last year because even if it's shrimp fried rice or vegetable biriyani at the end of the day it is still rice.FYI,vegetable biriyani I am so glad I tried you,because you are my answer to a delicious dish that doesn't have meat.The negative though is as expected I am basically a huge drum now,a friend that hadn't seen me since mid 2017, exclaimed 'UMENENEPA wala nini siku hizi?' 😭😭😭. People travel for many reasons; to explore parts unknown,to rest,to learn new things and to experience a different culture .One thing is for sure,whatever your reason for travelling is you must eat every where you go. 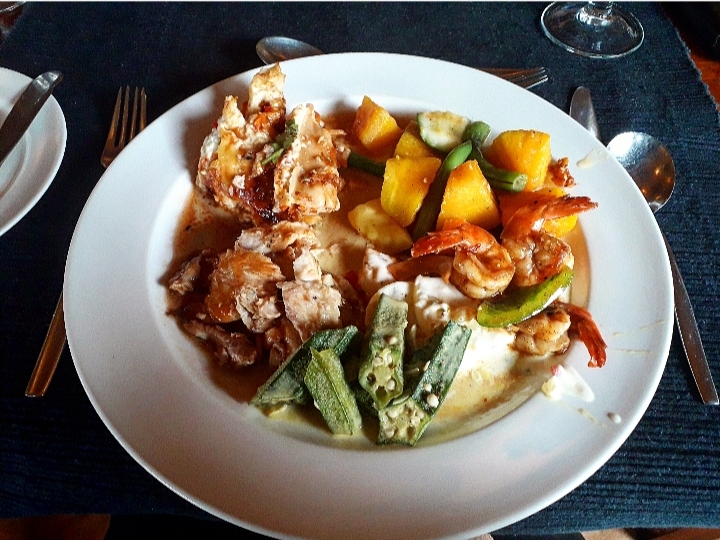 My philosophy as regards eating while travelling is 'DO NOT EAT WHAT YOU CAN EASILY PREPARE AND EAT AT HOME'.I kept this in mind while visiting Sri Lanka.It's an Island country in Asia nicknamed 'The Pearl of India Ocean'.If you are ever in this beautiful tropical paradise be sure to try these foods. It's very obvious that eating is one of those things that gives me joy.I am no glutton though so most times before a buffet confuses me,I try and make healthy choices.Red rice is whole grain,it has antioxidants and can aid in weight loss.On top of all this it so very delicious.Rice is a staple here.It's eaten at all meals including breakfast! My advise choose red rice for all it's health benefits.Also chances are like me this will be your first time eating it. 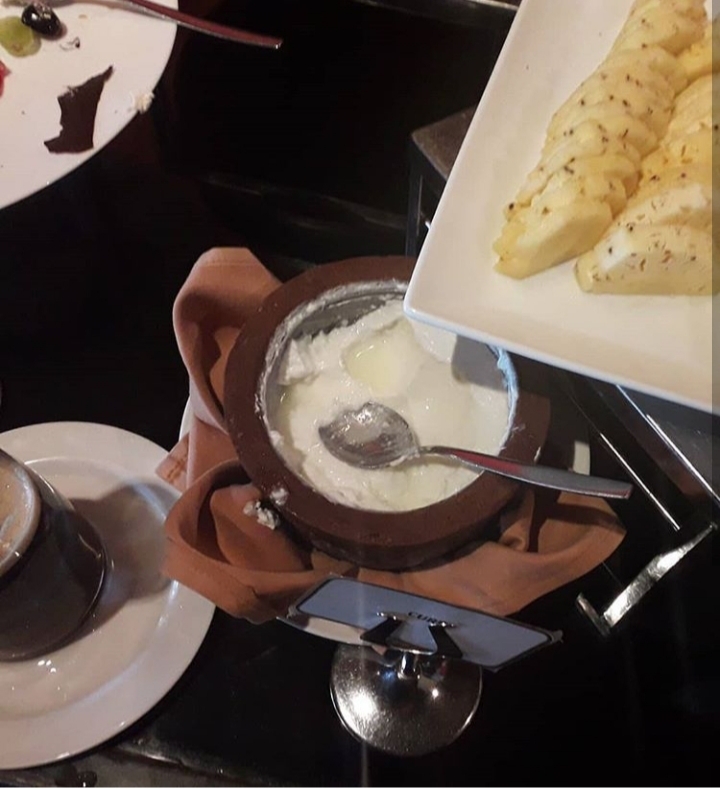 Of all the foods I tried,Buffalo curd was what stood out the most for me.It tastes a lot like plain yoghurt and is eaten with a syrup made out of jaggery.It's eaten as a dessert and felt like my redemption at the end of every large meal.This might be why I loved it so much.Guilt free dessert 😊. The deliciousness that is a egg hopper. 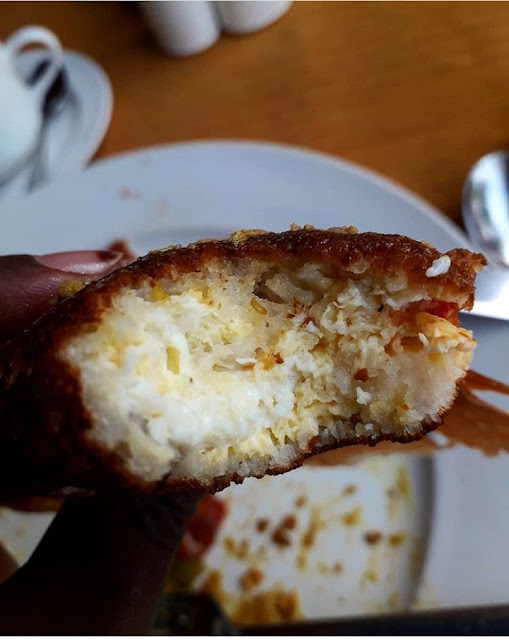 These are a breakfast meal that mimick the Somali anjera only difference is that they are bowl-shaped.They are made from fermented rice flour and coconut milk.One can have them plain or with an egg.They are the perfect breakfast as they are very filling. Sri Lanka is sea food heaven as is expected for any place that is along a water body.There is such a wide variety ranging from; different fish species,prawns,shrimps,crabs..................the list goes on and on and on.It will be a shame if one visited the country and didn't eat any sea food.Eat what you love and then try something from the sea that you have never eaten before. 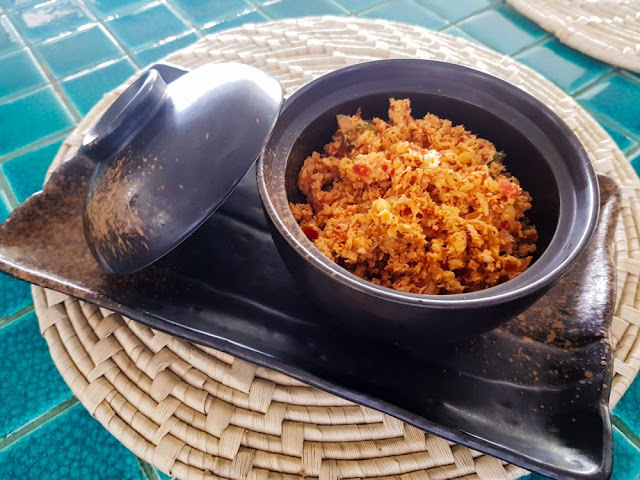 Spicy coconut sambol,if you love hot food this will make you very happy. Coconut sambol is some sort of 'kachumbari' that one eats with their meals.There are two types; plain and spicy.It's made out of grated coconut and if spicy loads of chilli is added to it.Sri Lankan's love their chilly therefore the spicy sambol isn't for the weak.The plain sambol however is so so good as it's just grated coconut 💖💖. 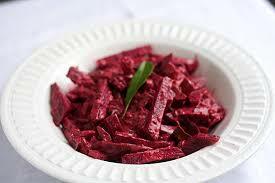 Who knew beets could be used for more than smoothies and salads.Honestly it had never even crossed my mind until the day I ate some spicy beet root curry.I didn't particularly love this because of how HOT it was.If you love hot and spicy food,then this should be in your must try list. Also after eating this I did some research and found a beet-root and sweet potato soup recipe that is everything.Easy to make,nutritious and so delicious. Sri Lanka is one of the most beautiful places I have ever been to.It's affordable,the people are very friendly,it's so very scenic and the food is out of this world.If you are looking for locations to travel to this year or to add to your travel bucket list.Sri Lanka should top it. Hair Growth Secrets-Five tips for length retention. Hair breakage that came as a result of damage from years of chemically relaxing my hair is what motivated me to go natural.At the time all I wanted was long natural hair.I thought this would come easy and fast however if there is anything being natural has taught me is that patience pays.This patience though has to be accompanied by a good hair regimen and care practices for one to see results. My goal is to have bra strap length by end of this year.So far so good, I am at armpit length 😄😄 something that has never happened before even with straight relaxed hair. 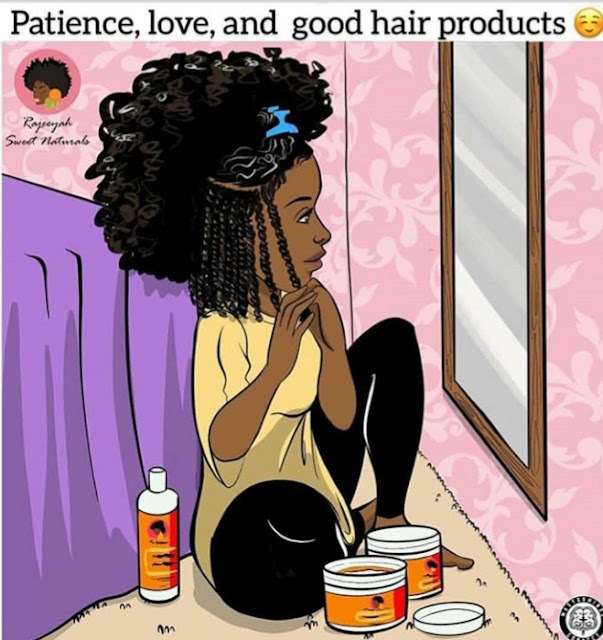 If like me you want long hair whilst being a lazy natural below are five easy to do and affordable tips that have worked for me. This oil is the real deal! at first I was very skeptical of what a single oil is capable of doing to aid in length retention and hair growth.This oil has worked magic for me and loads of other naturals if product reviews are anything to go with.I use it as a scalp oil.It's also my scalp massage oil and edges oil.My edges are thriving and my scalp is the most moisturised it has ever been.I use it twice a week. If there is only one thing you try after reading this post please let it be the use of rice water.It's basically free and has such huge impact.Rice water can be used as a final rinse,pre-poo and mid-week/daily hair spritz.What works for me is to use it as a pre-poo and as the liquid when I moisturize my hair mid-week.Using it as a pre-poo has reduced hair breakage during my wash days' to zero.Which is so very impressive considering how much hair I used to shed. 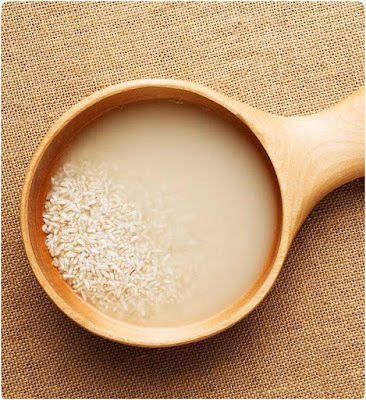 To prepare fermented rice water you only need water and rice.First rinse your rice,then using one cup of rice with two cups of water wash you rice until the water is milky/white,leave this for atleast 24 hours and the rice water is ready for use. If you really want long hair then you must embrace protective styles.They ensure your ends which are the most fragile part of your hair remain intact hence length retention. Good thing is that there are so many beautiful protective styles to choose from.YouTube will teach you all you need to know about any protective hair style.All you need is a lot of interest,an internet connection and a bit of time to practise the hair styles.With time you will become an expert and wonder why you ever left you hair open for extended periods of time.I particularly love cornrows and flat twist. Natural hair needs a lot of love,this is why you can't get away with moisturizing it once a week.This I learnt the hard way when I used to wash my hair every two weeks.My hair was always dry and brittle.I switched up my hair regimen to washing it weekly and moisturizing every Wednesday evening.It's like I got new hair.It's now softer,curlier and easier to manage.What this means in the long run is less breakage,more length retention and therefore long healthy hair.I still use the LCO method but now I used fermented rice water as my liquid 😉. Detangling your hair using a comb. Combing/detangling your hair is a good thing despite all that has been said about why naturals should be enemies with their hair combs.You just need to find what works best for your hair.I detangle my hair wet after deep conditioning before rinsing the deep conditioner out,I do this in small sections and I use a wide tooth comb. It's best to detangle your hair when it's wet,using products that have good slip and to do this in sections.Also a pro tip is to have your hair trimmed if it needs a trim, this way you will have no hair knots and detangling will always be a breeze. It's 2019 already! can you believe it.Insha aa Allah this will be the year we achieve all our goals and heart's desires.Have you set any hair goals,do you have tips for hair growth? please share I would love to know and maybe even practise some of the easier ones 😊😊. My mother says no one can fight it-the returning to God,but the way she fell,face first,in the dirt,mouth full of earth,air,teeth,blood,wearing a white cotton baati,hair untied and smoked with ounsi,I wonder if Kadija believed she was going to float-Warsan Shire in teaching my mother how to give birth. Warsan is sort of a big deal so to read this book it had to be with a cup of tea,snacks,incense burning on a good and happy day.All this to ensure that the experience could be as memorable as possible because I have been waiting and planning for this moment for the the last three years. Its easy to read and complete it within an hour but the poems require one to think through them and maybe even discuss them as part of a book club.I felt the poetry wasn't as straight forward as those in Upile's Soft Magic. 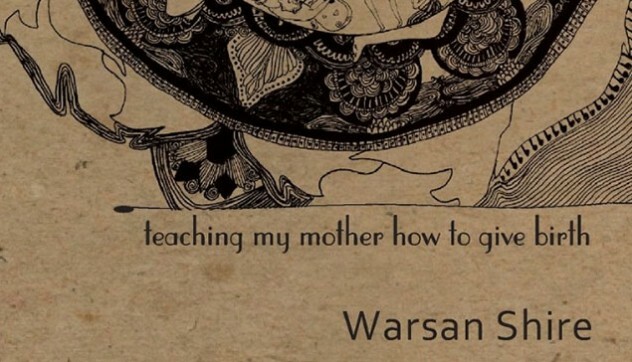 One of the things Warsan is really famous for is how her poetry captures the war in Somalia.She writes from many different point of views.I feel this collection is heavy on this particular topic.A lot of the poems are about the war in Somalia,immigrants and the effects of war on the people who have to live through it. In the poems Birds and What we lost in the Summer she covers how the Somali culture favours the male in a tone that questions this. Warsan from what I have read online suffered form Bulimia.This is to say at some point in time hard as it may to believe this great poet thought she wasn't enough.In the poem Bone she talks of how women especially young girls are forced to resort to negative habits.This so as to ensure the measure up to the societal beauty standards.